One of my challenges during the week when I leave the house very early is having breakfast. It’s early, I’m not hungry, I don’t have time (or the desire) to cook something right then and there…. so working on the habit of prepping breakfast ahead of time has been a welcome challenge for 2018. Cue this recipe which can be made in advance and just kept on hand ready to go. I made a large batch, froze some of the raw patties and cooked some for the days ahead. This way, when I need more I’ll pull the rest out of the freezer. Additionally, I kept this recipe simple so you can make them quickly, and of course I stuck extra veggies in there! I hope you enjoy. 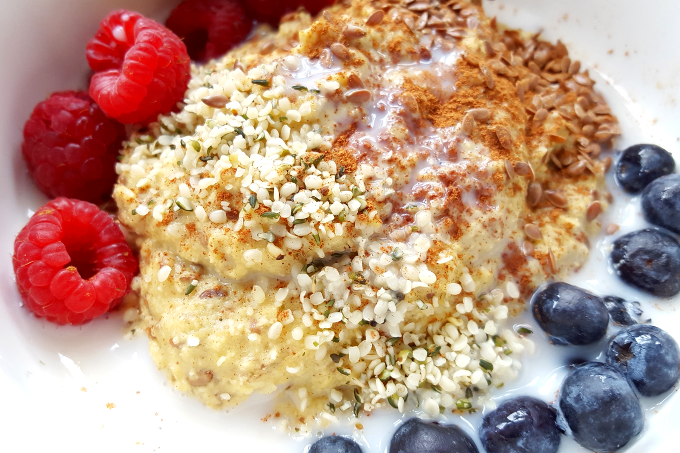 A clean, healthy and Whole30 compliant egg-free breakfast recipe. Form patties about 1.5 - 2 oz in size and place on a baking sheet pan (I find using an ice cream scoop works really well for this). Bake until reaches an internal temp of 165 - about 25 minutes depending on your oven and the size of your patties. If you cut open a meatball, it should no longer be pink in the center. *My oven cooks fast because it is convection, so mine were done in 20 minutes. 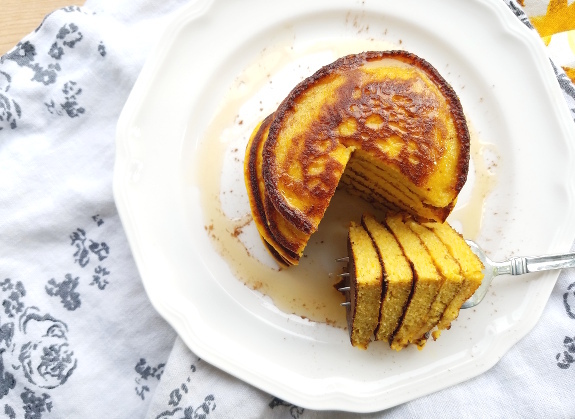 Gluten free, grain free, paleo friendly pumpkin pancakes for a special Sunday breakfast or brunch. 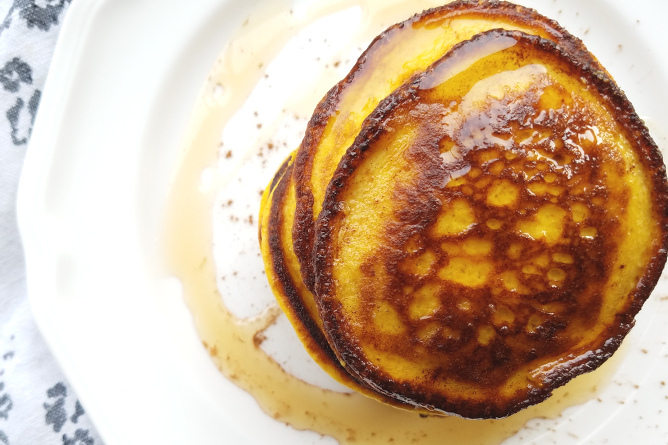 Serve with ghee and maple syrup. Kid friendly! Whisk pumpkin puree in a small bowl so it’s smooth. Add eggs and whisk to combine. The sweetener is optional as a topping - I’m all for keeping any type of added sweetener as low as possible, so use your discretion. I’ve been making more breakfasts for my personal chef clients these days, and this N’Oatmeal recipe is on the favorites list. 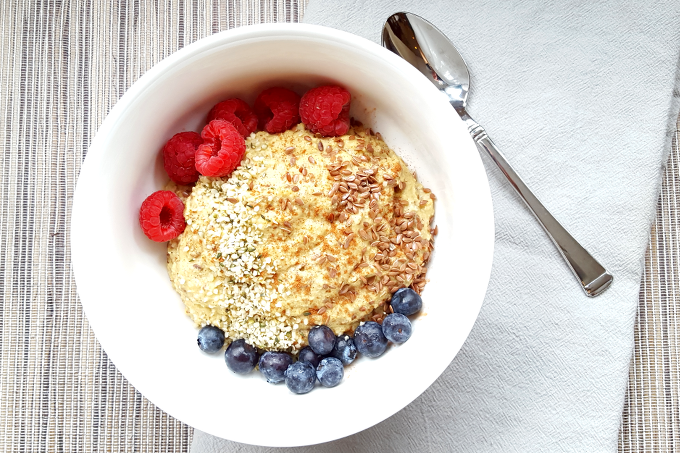 This is a take on oatmeal, but minus the oats for a more gut-friendly and healthy option. This recipe is gluten-free, grain-free and dairy-free but I promise it’s not lacking in flavor! Also, the flax adds a toasty, nutty taste that I love. 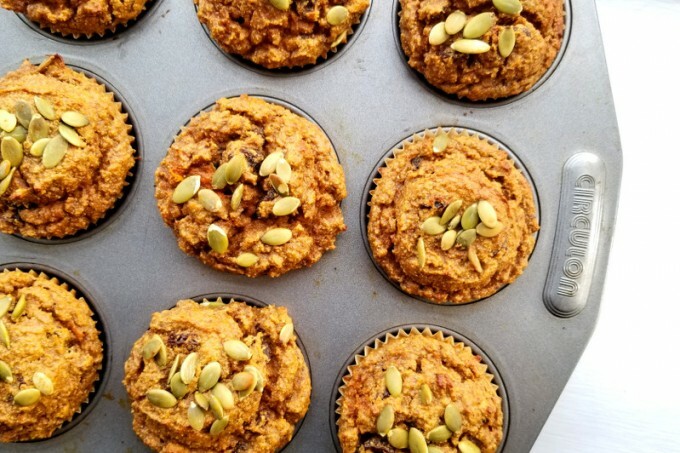 If you’re looking for a quick grab n go breakfast, you can make this recipe as “N’Oatmeal To Go” in which you portion it into muffin liners so it’s ready for ya in the morning. It’s even tasty cold if you don’t have time to heat it up as you head out the door. 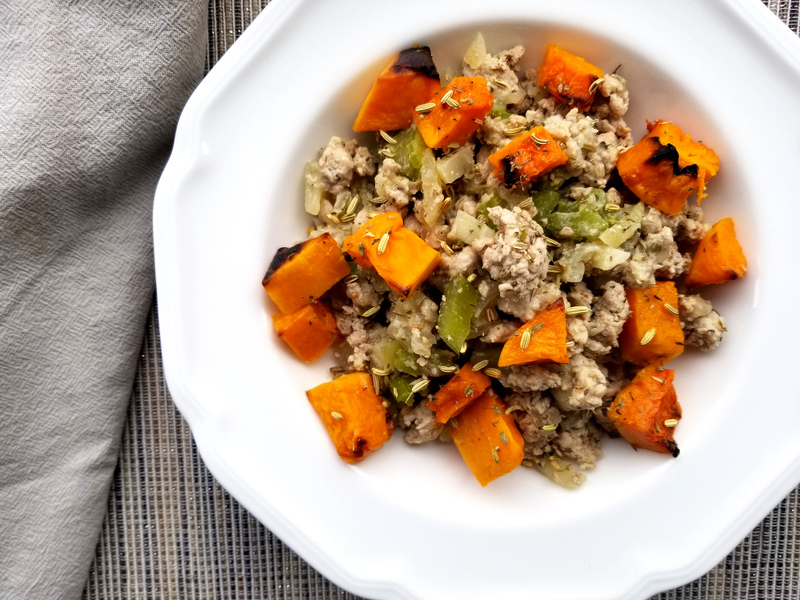 Note: if you want to make this a seasonal dish for the fall/winter, add the sweet potato! Yum. In a small pot, whisk together the coconut tmilk, flour, flakes and salt. Heat over medium-low heat just until begins to bubble and boil. Remove from heat, allow to cool for a few minutes. While that cools, mash the banana in a small bowl, add eggs and whisk to combine. Add the sweet potato as well if using. Slowly add the egg-banana mixture to the warm coconut milk, whisking as you do so. Return to medium-low heat (not too hot! ), stirring occasionally. Add cinnamon, and raisins if using. Allow mixture to thicken for about 5 minutes, continuing to stir occasionally. Add flax, stir to combine, then remove from eat. To make N’Oatmeal to Go: scoop mixture into muffin liners or small single-serve containers. Reheat in oven at 325 for about 10 minutes, or enjoy cold. I’m always looking for ways to incorporate veggies into the food that I cook, even when it’s breakfast! And especially when there are kids (or husbands) involved. I also make these for my personal chef clients who need on the go breakfasts- they can be made ahead and transport easily. They are gluten-free but who would know? I like to make these on some Sundays for brunch or special occasions with my hubby (he cracks the eggs and usually by then I’m chasing him around the kitchen with a spatula telling him to stop driving me crazy, it’s very romantic!). So, on to the recipe! 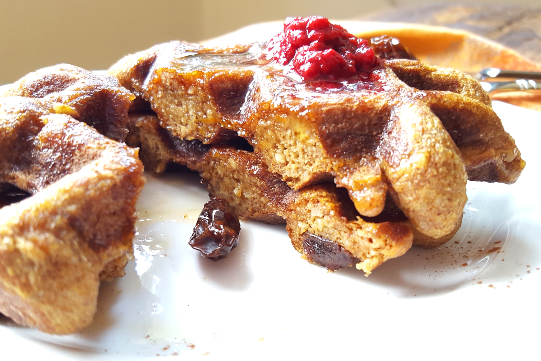 I love carrot cake and I love pumpkin, so why not put those together for some lovely waffles? An easy, healthy, gluten-free waffle recipe that is made with veggies. If you don't have a waffle iron, make pancakes! Also great for on the go breakfast. 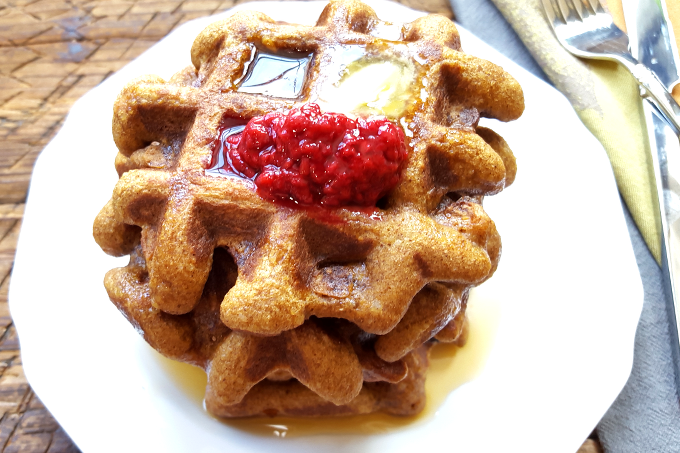 Preheat your waffle iron and brush with a little coconut oil or ghee. In a mixing bowl combine the pumpkin puree and carrots, mix, then add the eggs, syrup and vanilla. In another mixing bowl combine the flours, spices and salt, use a whisk to evenly mix and get rid of any clumps. Slowly sprinkle the dry ingredients into the egg mixture, whisking as you go to avoid clumps. Add the ghee/coconut oil, then the raisins, stir to combine. Scoop batter into your waffle maker and cook until golden brown- waffle makers come in different sizes so experiment with how much batter to pour until you get the perfect waffle. For my waffle maker I got 6 small waffles, which was good for 2 people. I suggest you double the recipe so you have some extras- they hold up great in the fridge for a snack the next day. I like to making simple “puddings” as occasional snacks or treats. This is the type of recipe that is really easy and also really versatile. You can play around with the liquids you use and the flavors you add. I sometimes sub some of the coconut milk with carrot juice for additional veggies. I suggest making it without any sweetener unless you really need it, especially if you make this as a snack. Anyone on a Whole 30 exercise caution in making a dish like this, and don’t use any sweetener! I make a version of this recipe with chia seeds for several of my personal chef clients, and also offer this recipe to anyone I do meal planning for as a great on-the-go snack. 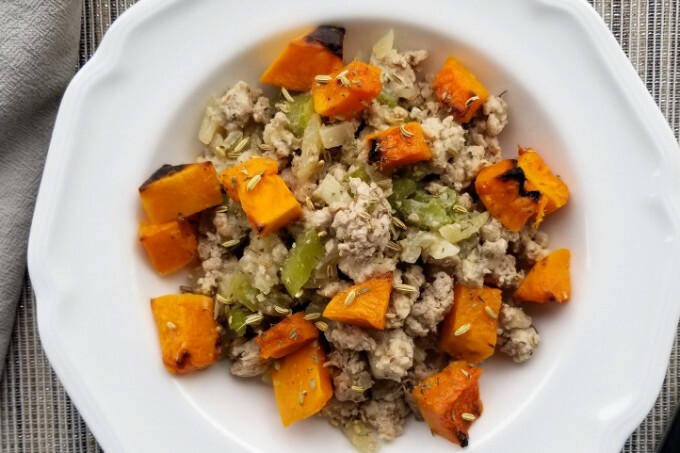 PSA: this is not a Whole 30 approved recipe! Healthy, easy, quick recipe for a snack or dessert. I find that children like it too if you just tell them it's pudding! Combine all ingredients in a blender except the collagen/gelatin or chia seeds. If using collagen/gelatin, run blender on low and slowly pour the powder into the smoothie to blend. For chia seeds, pour smoothie mixture into a bowl and then stir in the chia seeds. Portion mixture into desired storage containers. I use small 1-cup glass ball jars or Weck jars. Chill for at least 1 hour before adding optional apple topping. 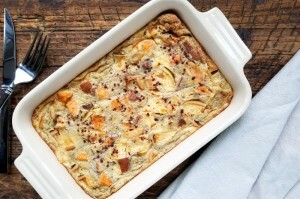 Toss apples, cinnamon and maple syrup together, scrape into an oven safe baking dish. Bake until apples are soft, 20-30 minutes, stirring occasionally. 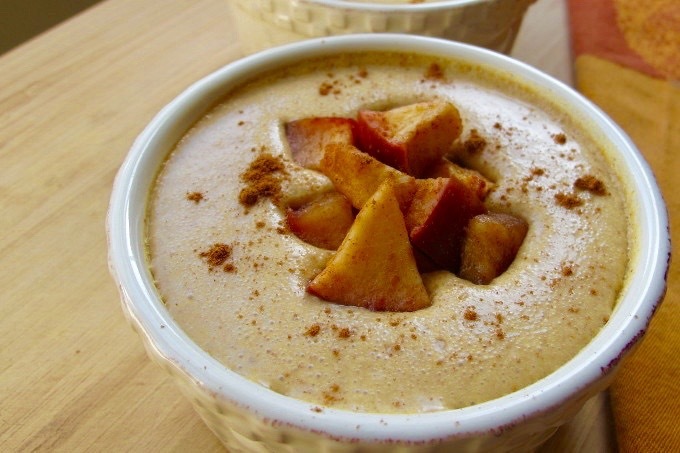 Once cooled and pudding has firmed up, add apples to top off the pudding and serve. Breakfast can be really challenging when switching over to a gluten-free or grain-free diet. 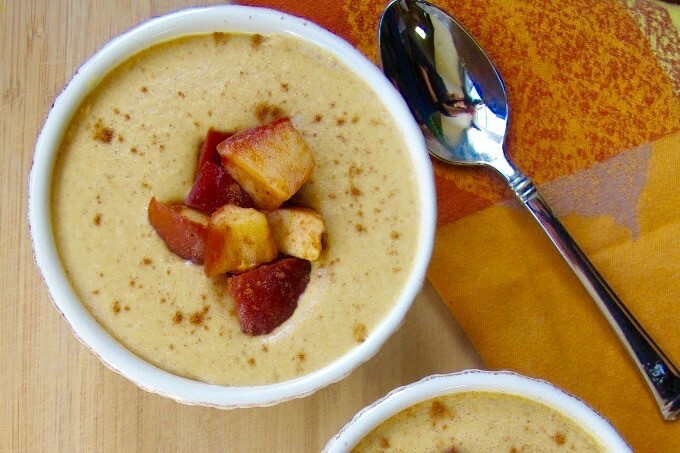 You may also be taking on a Whole 30 and finding your oatmeal no longer makes the cut! You definitely want to be careful if substituting any “gluten-free” foods – they are not necessarily good for you just because they are labeled gluten-free. Retraining your body to detach from “breakfasty” food is not easy! 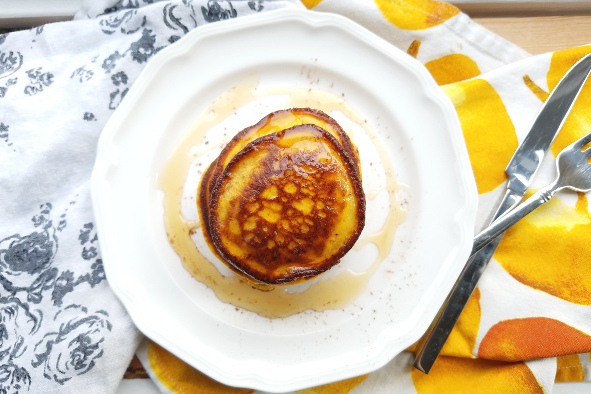 Cereal, pancakes, toast….. things that are sweet……we probably all grew up associating breakfast with sweeter flavors right? 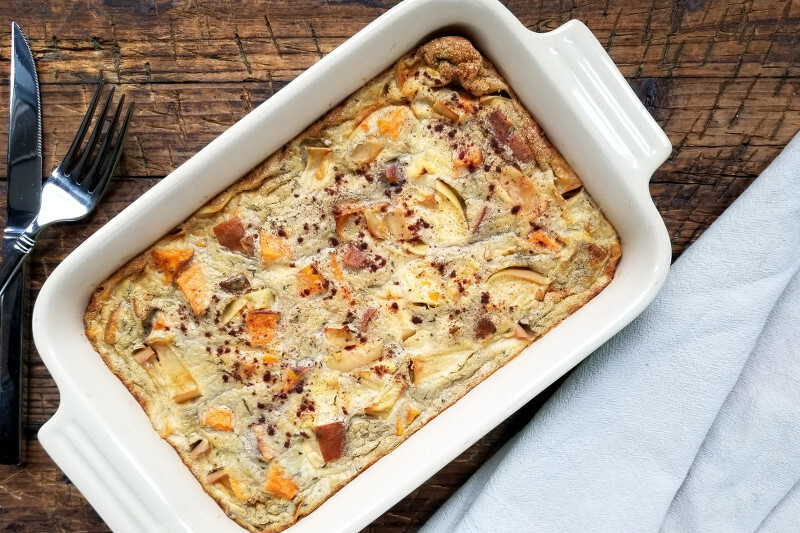 There can be a time and a place for healthier gluten-free versions of these, but they are not for every day, especially because even paleo versions of these things are so addictive. 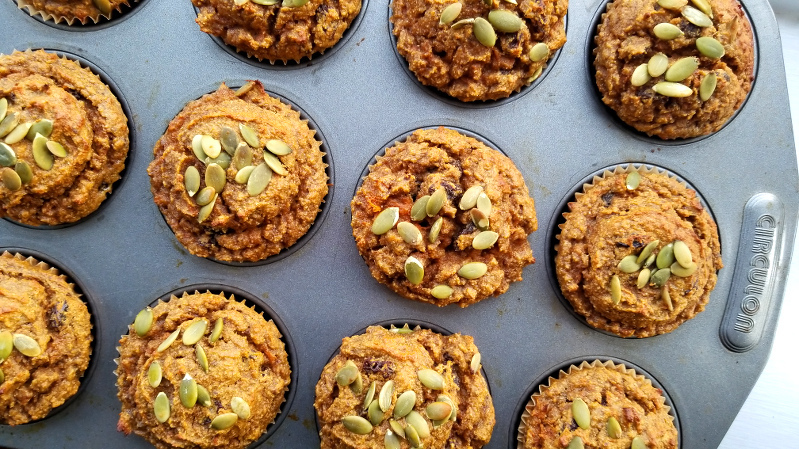 Personally, I sometimes make grain-free muffins or ‘pancakes’ on weekends, but if you find yourself craving these things every day, you should probably reconsider what you’re feeding yourself! 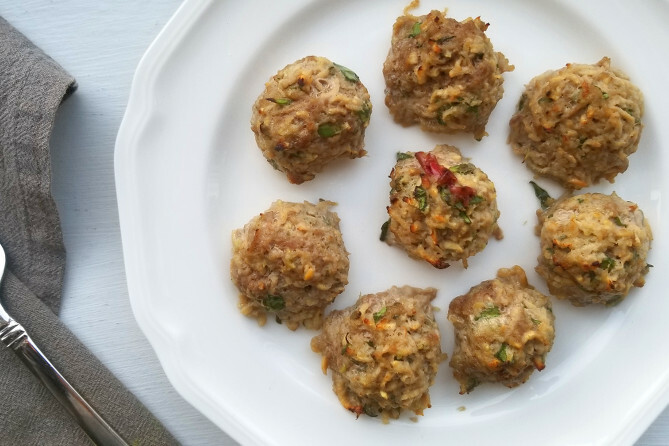 If you’re also avoiding eggs, you have additional challenges for breakfast, therefore, these patties are a great option for everyone (and they’re also Whole 30 compliant). I make these for my personal chef clients quite often, and even my husband approves of them (phew!). Simple recipe for a gluten-free, paleo-friendly, egg-free breakfast. Preheat oven to 375 degrees F for convection, 400 degrees F for regular ovens. Combine all ingredients in a medium bowl and mix until well combined. Line a baking sheet pan with parchment or foil. 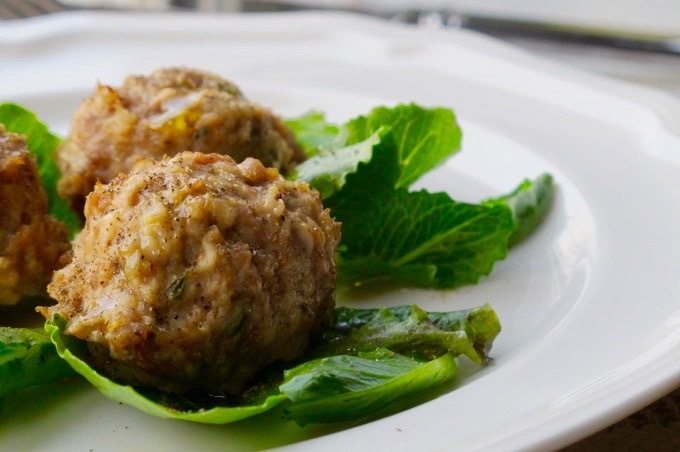 Form small patties by scooping about ¼ cup of the meat into your hands, then roll a ball and flatten it. You can also just form meatballs if you prefer. Line the patties on the sheet pan, close to each other but not touching. Bake for 15 minutes or until a thermometer inserted into the biggest patty reads 165 degrees F.
*If you’re following the autoimmune protocol and avoiding spices, you can remove the black pepper as well as the cinnamon/pumpkin pie spice. 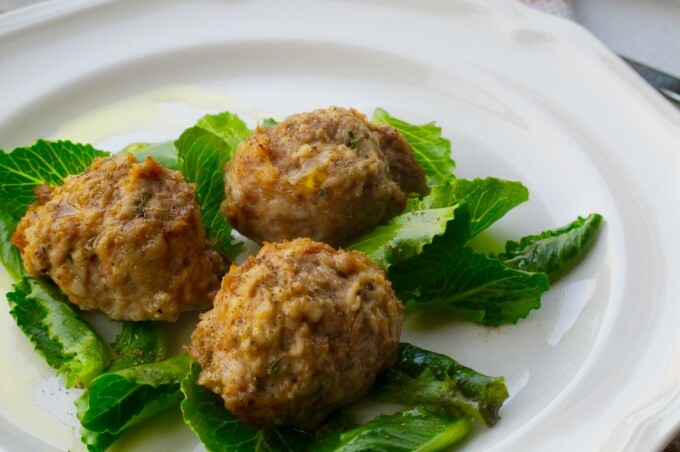 The herbs will still give these patties good flavor, although you may want to increase the amounts by about ½ tsp. Freeze the extra patties so you have back-up options to pull out when you need them. You can also double this recipe and make even more! 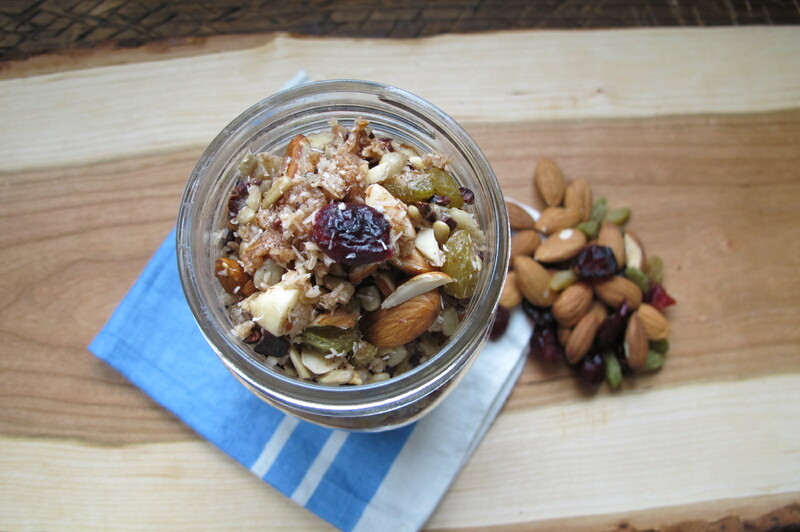 I make this granola a few days before I am going to travel anywhere, and it ends up being a great snack on the plane. I also make this for personal chef clients who need breakfast or snack options- so far it’s a hit! Not only is this recipe really simple, it is gluten-free and grain-free. If you wanted to make a nut-free version, just substitute the 1/2 cup nuts for an additional 1/2 cup of seeds. Gluten-free, grain-free and made with honey or maple syrup, this recipe is easier than you'd imagine. Combine all ingredients except coconut oil and honey in a mixing bowl. Combine coconut oil and honey in a small pot and heat gently over low heat until melted. Pour the oil–honey mixture over the other ingredients and stir well to evenly coat. It is optional at this point to toast the granola. This will bring out a nice warm toasted flavor but is not necessary. 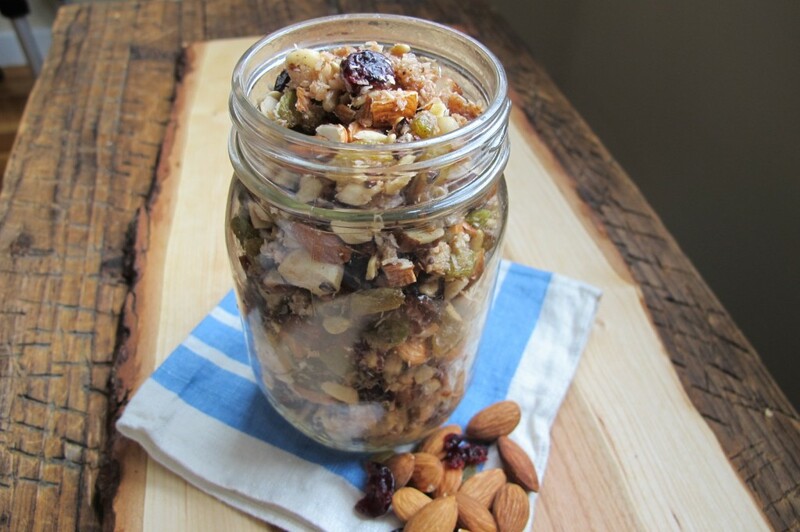 If toasting: heat oven to 325 degrees F.
Spread granola mixture out on a baking pan and toast for 10 minutes. Stir mixture around on pan and then toast for another 5 minutes. Allow to cool completely before storing in a glass jar.